Candy Corn Fudge . . . Just another pretty fudge. Candy Corn Fudge . . . . Just because I can. The coloring I used was Wilton’s gel and to give it a strong color I scooped out a bit with the edge of a teaspoon. I mixed the coloring into the sweetened condensed milk first before adding it to the chips to make the color more even. I prefer Ghiradelli white chocolate chips to other brands. Soften the white chocolate and shortening in the microwave for 30 seconds at 50% power. Chips will hold their shape until stirred so don’t microwave again until you stir the chips and shortening together. If they are not soft enough to combine, then microwave again in 15 second bursts at 50% power until most chips are melted. Add the colored milk to the melted chocolate, stirring gently until combined. Microwave for 1 minute, during which time the milk will begin to boil. Quickly stir again. And pour into the prepared pan. There were some chips that were not fully melted yet, but they seemed to finish melting after I poured the layer. I tried chilling the first layer in the freezer for the few minutes needed to prepare the second layer, thinking that would help the layers “stick” together if they were both slightly warm. For the third layer, I let the fudge totally set up in the fridge for a bit (like while we ate dinner!) before coming back and making the last layer. Didn’t seem to make any difference so do what fits your schedule and whim. Do, however, find a level spot in the fridge to place the cooling fudge so it doesn’t drift off to one side. If you have to set it on top of two dishes, put a half package of cheese on top of the shorter bowl so they are even – or whatever it takes! When I posted a white chocolate fudge once before, someone mentioned that they had a hard time lifting the finished fudge from the pan. I’ve never had a problem with that Maybe because I lift the fudge with its waxed paper lining a couple of times in the cooling process. Taking it out of its comfort zone—good for people, good for fudge is my theory! Others say spraying the pan lightly with cooking spray before adding the waxed paper helps.. There are three variations. One is the Traditional Candy Corn: Trim one edge of the fudge so you have a clean straight cut. Make an inch thick slice all the way across the chilled fudge. Lay the strip on your cutting board so the layers are visible and begin cutting triangles. Every other triangle will have the white layer on top and the yellow at the point, but I guarantee only you and I will notice that when it is on the plate! 🙂 Variation Two: Press peanuts into the top of the last layer. This is a play on the popular peanut and candy corn mix. I like this best for taste because I like nuts, first of all, and the saltiness of the nuts counteracts the sweetness of the fudge just like it does for the “real” candy corns. Variation Three: Figure out where you plan to make your cut for fudge pieces. Press a line of candy corn into the top and cut the finished fudge so that a candy corn adorns the center of each piece. Prepare 8x8 inch square pan by lining with waxed paper. Spray lightly with cooking spray. Microwave thirty seconds at 50% power. Add ⅓ cup of sweetened condensed milk and microwave for sixty seconds. Remove from microwave and quickly stir the milk and chips together until almost smooth. Pour into prepared pan and place in refrigerator. In DRY small/ medium microwaveable bowl, place 1 and ½ cups of white chocolate chips and 1 tablespoon of shortening. In the meantime, add orange (or combination of red and yellow) coloring to ½ cup of sweetened condensed milk to reach desired shade, stirring to blend thoroughly. Add milk to softened white chocolate chips and stir gently to distribute milk somewhat. Remove from microwave and quickly stir the milk and chips together until smooth. Pour over firm white layer and return pan to refrigerator. Repeat steps for orange layer -- EXCEPT use yellow food coloring. Place layered fudge in refrigerator and let set until fully firm, about 2 hours. To serve, let set at room temperature for ten minutes to soften slightly before cutting, especially if it has been chilled overnight. Cut with sharp knife, warmed with hot water. Dip into hot water and wipe before beginning additional long cuts to keep the colors clear. Traditional Candy Corn: Trim one edge of the fudge so you have a clean straight cut. Make an inch thick slice all the way across the chilled fudge. Lay the strip on your cutting board so the layers are visible and cut into equal triangles, alternating the angle of your knife and leaving a bit of space at the white layer when it is at the apex. Variation Two: Press peanuts into the top of the last layer before placing in the refrigerator to set up. For extra peanutty flavor, press peanuts into the top of the second layer before chilling it and adding the last layer. Variation Three: Figure out where you plan to make your cut for fudge pieces. 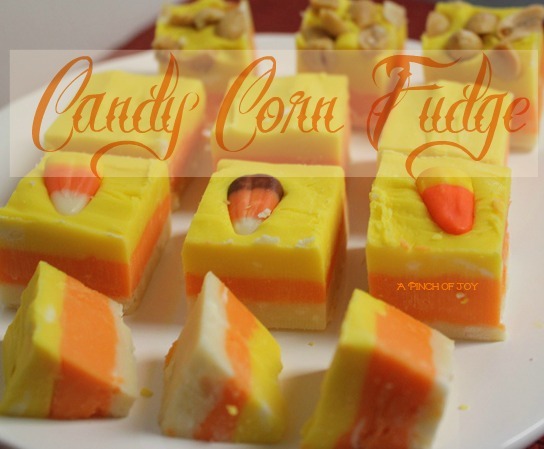 Press a line of candy corn into the top and cut the finished fudge so that a candy corn adorns the center of each piece. I agree with Savannah! But cute idea. Thanks for linking to Saturday Dishes. Pinned! I can only imagine how many pounds I could gain if I made this!